Municipography is a summary of current issues going through the Raleigh City Council and other municipal departments in the city. The point is to try to deliver any video, photos, and text associated with the discussions happening at City Hall or elsewhere. Since this is a downtown Raleigh blog, the focus is on the center of the city. I recommend email readers click through to the website to see the embedded video. An IKE wayfinding kiosk on display in front of Union Station. During the October 2, 2018 city council meeting, councilors received an update on the latest downtown wayfinding plan that comes from the Downtown Raleigh Alliance. 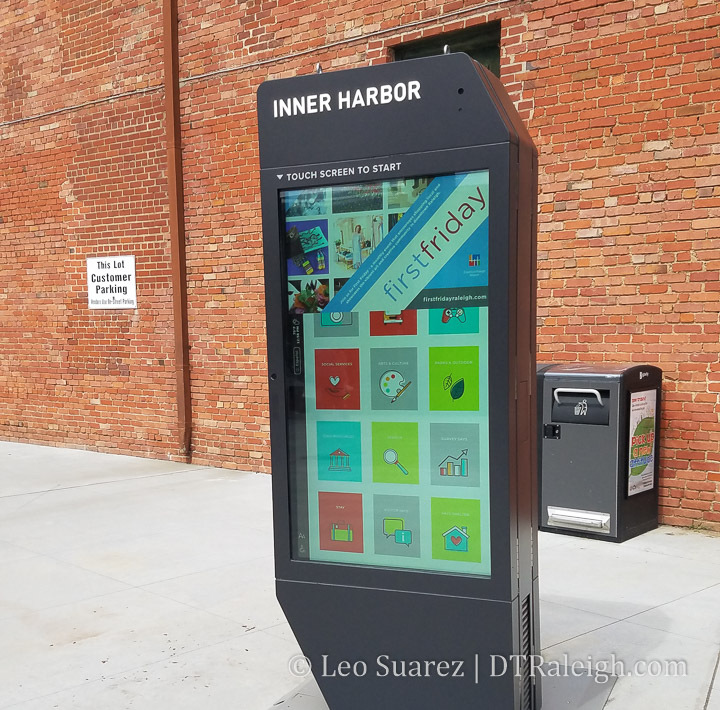 The presentation given introduces IKE, a free-standing kiosk with a touchscreen, that presents downtown retail, transit, and event info to pedestrians. The company, IKE Smart City, makes revenue off advertising with the DRA getting a cut of that revenue. In addition to the touchscreen, a built-in camera can be used for selfies, pedestrian counting, and even public safety if the city wanted it too. A lot of features seemed optional, tailoring the IKE experience for each community as Jibran Shermohammed, Director of Development & Corporate Counsel at IKE Smart City, mentions during the presentation. Below is the video of Mr. Shermohammed as well as DRA president Kris Larson at the council meeting followed by the discussion. The presentation by Mr. Larson and Mr. Shermohammed is near flawless, describing the kiosks and the agreements between IKE Smart City and the DRA. 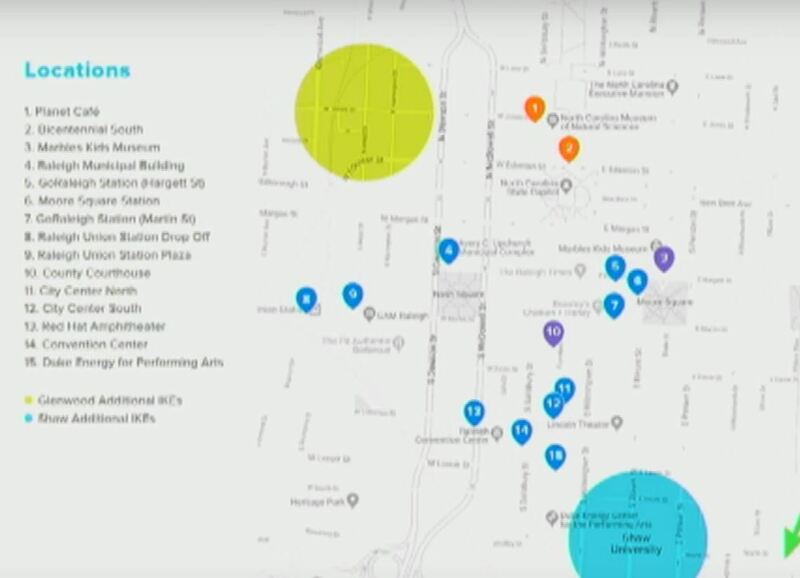 Wayfinding comes back into the picture from our 2015 Downtown Raleigh Plan and the system checks all the boxes in terms of accessibility and equity. The kiosks are also data gathering points collecting information such as pedestrian counts and usage, all anonymized and available for the city. The kiosks themselves are maintained by IKE Smart City including both the hardware and software. Any damage to the units are taken care of and each kiosk receives regular software updates. The advertising complies with all City of Raleigh advertising policy so anything you see around town right now, like on the buses, is basically the same as you’ll see on the kiosks. Finally, all this comes free of charge to the city. The company just needs the blessing of the council to allow them to be installed on public property. The approval to move forward with implementation, as well as a text change to our sign ordinance, was needed to make these kiosks happen. It seems like all bases were covered here on this project yet councilors had concerns or at least perceived concerns, about the IKEs. From my viewing of the discussion, I picked up unreasonable criticism of the system as well as far-reaching efforts to derail the project. Masked as defenders of the public right-of-way, a subset of the council, which I like to call “The Council of No”, were pulling extreme edge cases here as reasons to not move forward. Rather than tailor the IKEs to something that satisfies council, some councilors were against the kiosks for reasons with little or no backing at all. NOTE: Councilors Corey Branch and Dickie Thompson were not present. Both Councilors Kay Crowder and Stef Mendell were concerned over the brightness of the kiosks. From the meeting discussion, Travis Crane, an Assistant Planning Director, called out the acceptable brightness levels in our city’s signage ordinance. Mr. Shermohammed confirmed that the kiosks were lower, operating similar to how a smartphone dims at night or in dark rooms. Yet, the councilors were still concerned over brightness. Map of potential locations for the kiosks. Councilor Russ Stephenson compared the kiosks as “last-century technology” and wanted to see something more mobile, like for a smartphone. While I agree with Councilor Stephenson to a degree, he may be forgetting that we are surrounded by tried and true technology all around us. Why should the city adopt the latest and greatest at a high cost? Better yet, what disadvantage do we have if the kiosks are deployed in addition to some new mobile tech? To be against the kiosks and pitch something else is a project-killing move from my point-of-view. Councilor Stephenson’s data privacy concerns are also unfounded. He claims that Raleighites don’t want to be tracked or have data collected about them, even if it’s anonymous. He must not be aware of the dozens of pedestrian, biking, and traffic counters that have been deployed all over the city, collecting the same information that IKE would. This is a feature that could also be turned off if the city wanted it too. Councilor Stewart, not a member of The Council of No, asked if any other cities are worried about the IKE’s screen brightness and it’s contribution to light pollution. Mr. Shermohammed says that no cities have raised issues with this. Councilor Cox also tried to derail and discount the work of the DRA by lofting up a suggestion about Bluetooth beacon technology. The tech itself doesn’t matter but, as a city councilor, to have allowed the DRA to go forward with the kiosk project about a year ago and now suggest something completely different isn’t helpful for anyone and is borderline disrespectful. It was clear to the Council of No that this effort would alter our sign ordinance and possibly allow even more signs that looked like a “bright” IKE kiosk in the future. This is precedent-setting moves and the Council of No always takes the unreasonably fights against projects like this rather than taking a collaborative, compromising approach. While certainly not the biggest issue downtown Raleigh faces, I take issue with the treatment of this project because there are so many things this helps, so many angles that are covered here and yet we have councilors that can’t move things forward because of perceived negative outcomes and a perceived future that “looks like Las Vegas” as Councilor Crowder states. In the end, the Council of No asked city staff to create a high-level list of what other cities are doing in terms of wayfinding, something the DRA has already done and chosen a solution for. This belittles their work, in my opinion, and am really questioning our councils commitment to downtown Raleigh. Come chat about council’s support of downtown Raleigh on the Community. If you can’t see the embedded video, click here. 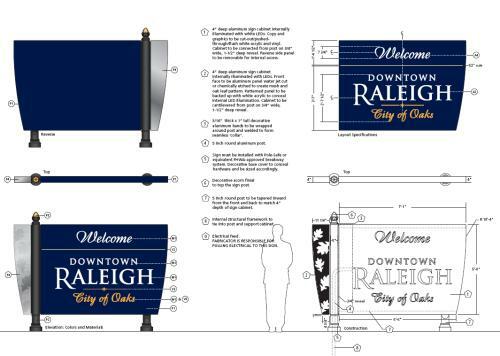 During the November 8, 2017 city council meeting, city staff and the Downtown Raleigh Alliance gave a nice update on plans to bring interactive wayfinding kiosks to downtown Raleigh. Negotiations are ongoing with Orange Barrel Media, producers of IKE, an “interactive kiosk experience” and if all goes well, the rollout of the system could take place in Spring 2018. Since downtown Raleigh doesn’t have a designated shopping street these kiosks can only help direct folks to the right places or even find ones they didn’t know about. With transit info alongside this information, it may make users aware of the system and consider an alternative method. The kiosks may be outside as well as inside some locations including the convention center and union station. Other proposed locations include City Plaza, Moore Square, Seaboard Station, and Shaw. Council approved the proposal and we just might see these pop up in 2018. 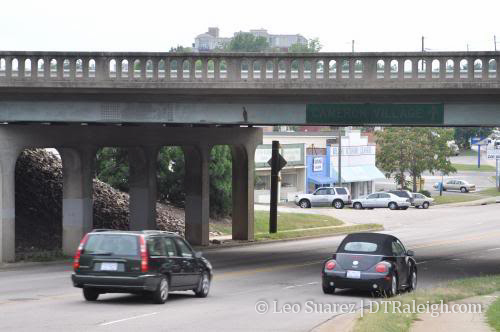 In the picture above, there is a downtown Raleigh relic. An old sign that has been in its place for many years, standing the test of time. Actually, I have no idea how long this sign has been here but from the looks of it, it was put up long ago and now completely forgotten. I’m talking about the sign on the Capitol Blvd. bridge over Peace St. that can be seen when heading west. 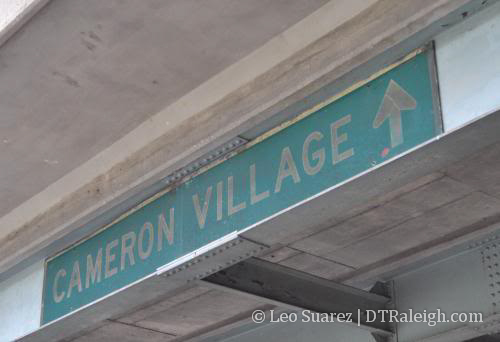 It points towards Cameron Village and leads cars in the ‘up’ direction. It is old, rusty, faded and needs to be replaced. It’s too bad we did not get another one along with the many others placed around downtown as part of the wayfinding system. Perhaps no one is heading towards Cameron Village when on Peace St. or maybe we don’t need it at all? I’m sure many of you have driven under the bridge many times and have never noticed it. Come on, you can admit it. 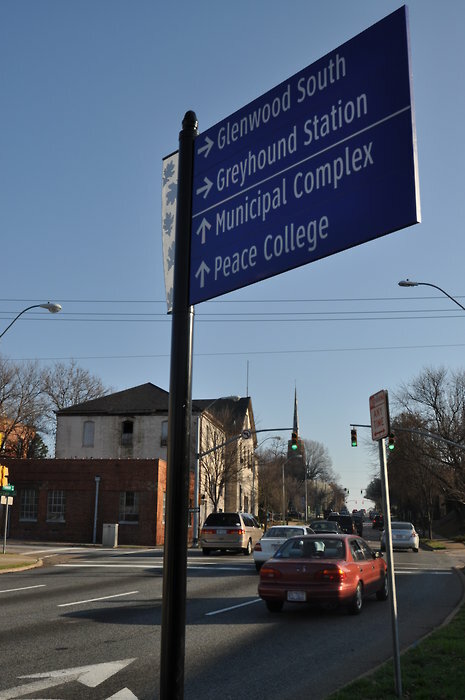 Wayfinding signs are popping up around downtown. 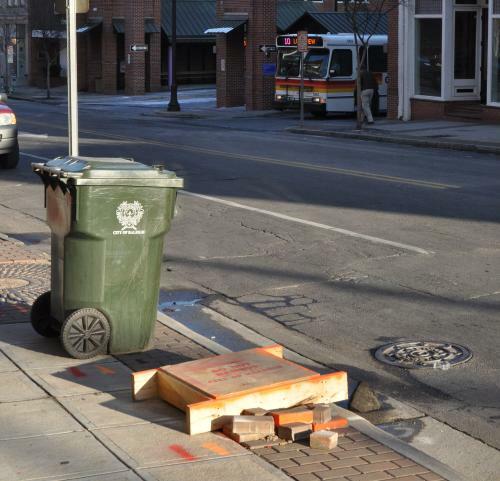 If you have been lurking around Hargett or Wilmington St. recently, you may have noticed some holes in the sidewalks. I’ve started to notice more and more of these wood covered holes at the intersection of Fayetteville and Hargett, Wilmington St. near the museums, and near the Moore Square parking deck. At first I thought these were the parking meters that we have discussed before but that would be too quick a move on the city’s part. It finally hit me though and these holes have to be the locations for the new downtown signage that will go up soon. The signage was approved last year and the city’s website has all the info. 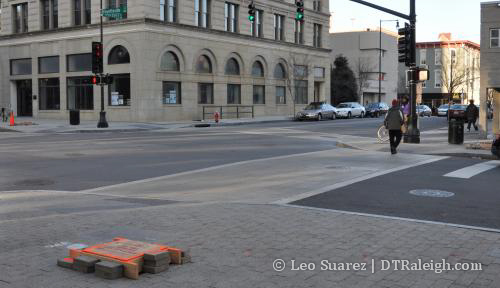 Looking at the pdf files confirms that these holes will have new signs to help people get around downtown Raleigh. Here are some key links for those that want more info. Three holes at Fayetteville/Hargett St.
On Hargett St. across from the bus station.